Candle Moroccan scents are earthy, spicy and sensual. 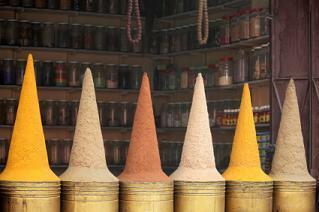 Moroccan candle scents invite you to close your eyes and inhale the fresh, open market flavors of the local Souk. Morocco is a rich and diverse country located in North Africa across the Gibraltar Straits from Spain. The country is an exotic location and a popular destination for spice traders from all over the world. Candles with a Moroccan scent suggest the sweet scent of vanilla perfuming the desert nights with just a touch of sandalwood, oak moss, ground ginger, clove and velvet roses. Morocco is a land of mystery and romance. Candles with Moroccan scents add something unique to your home. The country features one of the most diversified cuisines in the world due to visitors traveling from all over the map. Historically, Morocco played host to the Phoenicians, Carthaginians, Arabs, Sub-Saharan Africans, Romans, Vandals and Moors. This colorful tapestry of peoples brought the flavors of their worlds together in the market places of Marrakesh, Casablanca and Tangier. Candle Moroccan scents are a combination of flavors that you can both smell and taste. Light any candle labeled Moroccan, close your eyes and inhale deeply. You can taste the flavors of ginger and nutmeg on your tongue and smell the rich musk of sandalwood and vanilla as it tickles your nostrils. The aromatic combination of scents and flavors transports you from your home to North Africa and inspires creativity. Invite the fresh winds and desert tents of the North African country to your living room with candle purchases. Candle Delirium - From fresh fig to earthen spices to the aroma of exotic wood, Candle Delirium offers you exotic shopping opportunities. Amazon - This online retail giant offers Gold Canyon golden amber vanilla Moroccan scented candles ideal for relaxing, entertaining and creating that exotic atmosphere at home. 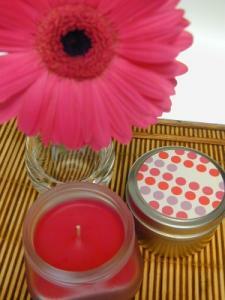 Village Candle - Use the scents of African Safari and Amber Woods to invite your significant other to a romantic evening. Etsy - Find exotic scents like Moroccan fig, sandalwood, Moroccan spice and more. Create a romantic evening with the exotic scent of Morocco. The soft, amber hue and exotic musk are just the right spice for a romantic evening at home. Drop some throw pillows on the floor, dim the lights, light the candles and indulge yourselves in a visit to an exotic land in your own living room. Add a few candle lanterns in the Moroccan style to increase the illusion on a warm, dry night in the summer time, and you can celebrate the wonders of the North Africa together. Mix your scents lightly using a vanilla base. Keep accurate measurements of how much scented oil you use each time until you find the combination that works for you. Do not be afraid to add other flavors to your creation. When making your own candles, be sure only to use scented oils designed specifically for candle making and observe safety procedures at all times.